For other uses, see Reel (disambiguation). A reel is an object around which lengths of another material (usually long and flexible) are wound for storage. Generally a reel has a cylindrical core and walls on the sides to retain the material wound around the core. In some cases the core is hollow, although other items may be mounted on it, and grips may exist for mechanically turning the reel. The size of the core is dependent on several factors. A smaller core will obviously allow more material to be stored in a given space. However, there is a limit to how tightly the stored material can be wound without damaging it and this limits how small the core can be. any functional requirements of the core e.g. With material such as photographic film that is flat and long but is relatively wide, the material generally is stored in successive single layers. 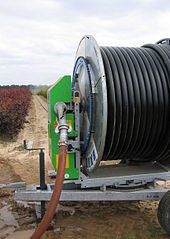 In cases where the material is more uniform in cross-section (for example, a cable), the material may be safely wound around a reel that is wider than its width. In this case, several windings are needed to create a layer on the reel. "Film reel" redirects here. For reels used to process film, see Developing tank. It is traditional to discuss the length of theatrical motion pictures in terms of "reels". The standard length of a 35 mm film reel is 1,000 feet (305 m), which runs approximately 11 minutes for sound film (24 frames per second) and about 15 minutes for silent film at the more-or-less standard speed of 16 frames per second. Most films have visible cues which mark the end of the reel. This allows projectionists running reel-to-reel to change over to the next reel on the other projector. A so-called "two-reeler" would have run about 15–24 minutes since the actual short film shipped to a movie theater for exhibition may have had slightly less (but rarely more) than 1,000 ft (305 m) on it. 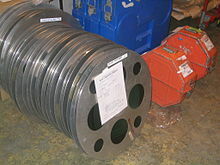 Most modern projectionists use the term "reel" when referring to a 2,000-foot (610 m) "two-reeler", as modern films are rarely shipped by single 1,000-foot (305 m) reels. A standard Hollywood movie averages about five 2,000-foot reels in length. The "reel" was established as a standard measurement because of considerations in printing motion picture film at a film laboratory, for shipping (especially the film case sizes) and for the size of the physical film magazine attached to the motion picture projector. Had it not been standardized (at 1,000 ft or 305 m of 35 mm film) there would have been many difficulties in the manufacture of the related equipment. A 16 mm "reel" is 400 feet (122 m). It runs, at sound speed, approximately the same amount of time (11–12 minutes) as a 1,000-foot (305 m) 35 mm reel. A "split reel" is a motion picture film reel in two halves that, when assembled, hold a specific length of motion picture film that has been wound on a plastic core. Using a split reel allows film to be shipped or handled in a lighter and smaller form than film would on a "fixed" reel. In silent film terminology, two films on one reel. As digital cinema catches on, the physical reel is being replaced by a virtual format called Digital Cinema Package, which can be distributed using any storage medium (such as hard drives) or data transfer medium (such as the Internet or satellite links) and projected using a digital projector instead of a conventional movie projector. Actors may submit a demo reel of their work to prospective employers, often in physical reel format. ^ Devos, Fred; Le Maillot, Chris; Riordan, Daniel (2004). "Introduction to Guideline Procedures Part 1: Equipment" (PDF). DIRquest. Global Underwater Explorers. 5 (3). Retrieved 2009-04-05. ^ Kawin, Bruce F. (1987). How Movies Work. University of California Press. p. 46. ISBN 9780520076969.